Dosbat: Arctic Methane: A Cause for Concern. Arctic Methane: A Cause for Concern. In the previous two posts I've outlined why I don't see observed methane release from the East Siberian Shelf (ESAS) to be the start of a fast process of catastrophic release. This is not to say I don't think this is a danger, however I see the danger as being more nuanced than some commentators and bloggers are claiming. Methane emissions from the Arctic region and ESAS may have the power to take our initial perturbation of CO2 emissions (being the largest single anthropogenic forcing, and the anthropogenic forcing with the greatest potential for future increase), amplify that perturbation, and perhaps even take AGW substantially out of our control. While we may not have enough fossil fuel to take us into the high-end IPCC scenarios, methane from the Arctic and the ESAS may just be able to take up the slack as our emissions fall this century due to geological constraints on fossil fuel production. The ESAS is not yet a major contributor to Arctic methane emissions, this is acknowledged by Shakhova and Semiletov, source. Dmitrenko et al's modelling study finds that the last few decades of warming have caused a 1 metre deep recession of the hydrate stability zone, with the inevitable further warming due to CO2 emissions this process will continue. However the East Siberian Arctic Shelf and its methane hydrates are not a major player yet. I've recently presented a set of videos from the AIRS system, courtesy of Dr Yurganov, here, and have discussed them here and here. From these I've noted a pattern in the atmosphere above the East Siberian Arctic Shelf (ESAS) which could be related to emissions of methane from that region. However this pattern is dwarfed by the far larger pattern linked to emissions from Arctic wetlands and tundra. This is supported by research into the isotopic signature of methane in the Arctic atmosphere. Because methane from wetlands, tundra (permafrost melt) and marine hydrates (in the ESAS) is from a biological source it is depleted in carbon13, the heavy isotope of carbon, carbon12 being the most common isotope. Fisher et al examined the isotopic signature of methane in the Arctic atmosphere and found that wetland emissions were the dominant source in 2008 & 2009, with gas leaks (from gas production fields) having a significant role in winter and a lesser possible contribution from the ESAS. This shows that aside from the ESAS, other emissions from the Arctic region must be borne in mind. In these posts I have concentrated on the ESAS purely because it is the risks from methane emissions there that I consider to be overstated. M King Hubbert produced a paper in 1976 that showed the following graphic of human consumption of fossil fuels in the context of 5000 years in the past and future. Hubbert 1976, figure 10, Epoch of fossil fuel exploitation in human history during the period from 5000 years ago to 5000 years in the future. Vertical axis - consumption per year. It's debatable how much fossil fuels there are, there are uncertainties, especially with regards coal and unconventional fuels (e.g. fracking and indeed maritime methane). However none of that will change the overall picture: Fossil fuels are a limited resource. 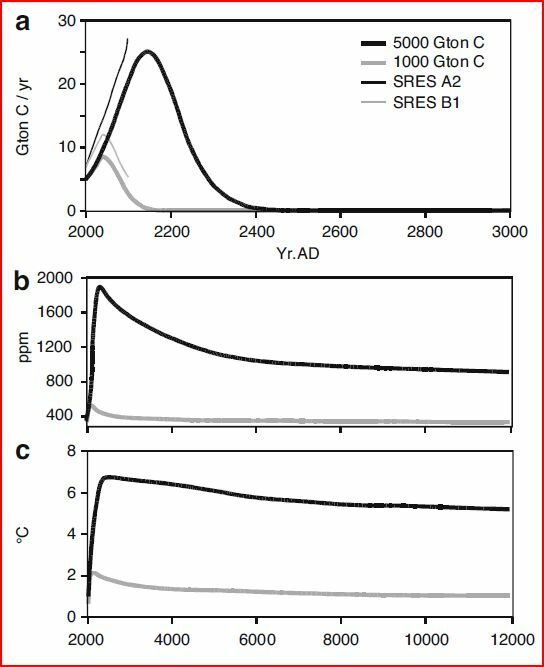 Yet their impact will persist, Archer & Brovkin showed that our CO2 emissions will have a substantial long term impact, with a tail of increased atmospheric increase that will last for up to around 100,000 years, in other words 'forever' for human timescales. Archer & Brovkin, figure 2, panel a; profiles of human release of 1000 and 5000 Gton Carbon, panel b; the resultant atmospheric CO2 concentration, panel c; the global mean surface temperature resulting from the CO2 concentration. For perspective, according to the CDIAC approximately 340 billion tons of carbon have been emitted since the 1750s. So we have some way to go to reach 5000Gt Carbon, but are approaching halfway to 1000Gt. There's been an article recently at Skeptical Science with a graphic that sums up the main reason I think we're at Peak Oil, I've previously calculated using EIA data that, on a national basis, 23% of world oil supply failed to respond to the price increases from 1998 to 2008. This I find suspicious at the least - why has basic economics failed? Increasing price should be a strong incentive to increase supply. The conclusion I (and others) draw is that geological constraints have come to the fore. Peak Oil does not however mean we're running out of oil, it merely means we have hit a stage where the continual increase in supply to meet increasing demand has been limited by geological constraints. As a very rough ballpark figure we're probably about halfway through oil, within decades the same will probably be the case with gas (e.g. Bentley 2002). Coal is more uncertain, I am persuaded we don't have hundreds of years left, but that may be material for a future post. Suffice to say: On balance I think we will very probably meet and exceed 1000Gt carbon emissions from fossil fuels, but I do not think it is plausible that we will reach 5000Gt. This might seem reassuring, however these figures do not include potential amplification by 'natural' emissions of carbon, particularly from boreal wetlands, permafrost and marine methane hydrates. The problem is that it is not known what amounts of such emissions will come into play. As I've argued I do not think the more catastrophic Gt/year emission scenarios are realistic, however even a more chronic emission has the potential to add to the long tail found by Archer and Brovkin. I've previously posted about research that shows how a cessation of fossil fuel emissions will unleash the full power of global warming, which is currently masked by sulphate aerosols. In the long run what we will see is not an immediate cessation as fossil fuels 'run out', but a reduction in consumption as prices drive 'demand destruction'. It's possible that we will crack fusion, which unlike fission has the potential to provide an unrestricted supply of energy. Short of such an unforeseen eventuality, we will probably get to a stage where, to keep the lights on, we will burn anything we can, including the dirtiest, most sulphurous, fuels. I don't know in detail what is going to happen regarding the ESAS and wider Arctic methane emissions. However I have stated in detail in the previous two posts why I am unconvinced by the popular claims that within a few years we'll see catastrophic climate change due to Arctic methane. As I've stated these doubts I feel the ball is now in my court to say what I think is a feasible worst-case scenario, the figures in what follows are merely ball-park guesstimates, but I think the following is a far more likely worst-case scenario than talk of an imminent methane apocalypse. Given the observed increase of methane emissions from the Arctic since the sea-ice crash of 2007 it would seem that the release of the Arctic store of methane is underway. Leonid Yurganov's London Presentation shows that up to 2010 the re-assertion of an upward trend in the atmospheric concentration of methane represents an increase of around 20 teragrams, that's 0.02Gt (1000 teragrams = 1 petagram = 1Gt). For context the McGuire et al review (the section headed "Surface Methane Exchange") finds that the Arctic emits between 0.032 and 0.112 Gt of methane per year, they find that recent estimates have been lower than the 0.112Gt upper bound, however for my purpose I'm happy to take that upper bound. Partly this is because of the uncertainty, partly to take into account the possibility of rapid growth of Arctic methane emissions. But also, as discussed previously, winter AIRS retrievals are suggestive of an increase since 2007, this January's AIRS retrievals show the highest concentrations for any month in the whole series. Furthermore the Arctic is warming at around 1degC per decade. I'm going to make another assumption; that emissions will increase, while consumption (from oxidation and the biosphere) will not increase as fast, for ease I'll assume they don't increase. Schmidt & Shindell found that the best match of methane emissions using a model of the PETM was 0.3Gt per year. So getting to that level would require Arctic emissions to increase roughly 10 to 3 times the current emission rate, which seems quite feasible over this century. However it should be noted that this increase for land emissions would rely on the land warming wet, if it warms dry the primary emission would be CO2, methane emissions would reduce. I've noted previously that we can expect episodes of substantial emissions, based on evidence of ocean pockmarks, similar process may come to play on land permafrost. However again for ease I'll assume Schmidt & Shindell's 0.3Gt/year average flux. What impact would a 0.3Gt/yr emission have? Here I'll turn to David Archer's recent post at RealClimate, here. As far as I can work out the model doesn't convert CH4 to CO2 after its lifetime is spent (i.e. a test using a very large transient of methane doesn't impact the CO2, which is derived from a Business as Usual scenario). So the model allows us to see the effect of such an injection of methane on its own. Using no background methane increase (chronic flux), and applying a 30Gt spike over 100 years gives 100 years at 0.3Gt per year. 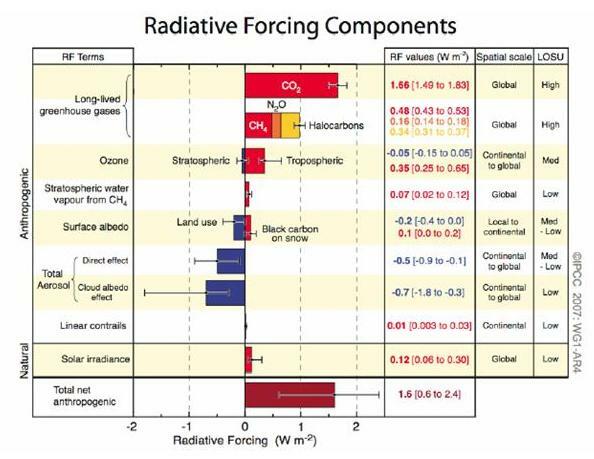 The resultant radiative forcing is around 1.5W/m^2 with only a modest increase of methane lifetime (7.5 to 10 years). For context from IPCC AR4 (via RC) the current radiative forcing of CO2 is roughly equal to the net anthropogenic forcing at around 1.5W/m^2. So a large chronic methane release of the size Schmidt and Shindell find best matches the PETM has the capability to double the current anthropogenic radiative forcing. This is a conservative estimate of radiative forcing because decomposed methane doesn't add to the CO2 burden, as would actually happen. In a recent (admittedly emotional) post on warming and drought, I gave my opinion on some recent findings from James Hansen. In essence the signature of AGW has a high-end bias, leading to increased instances of extreme high temperatures. This has a role in drought as revealed by research linked to in that post on Australia's 'Big Dry' (there's much more research along similar lines). At Stuart Staniford's excellent blog "Early Warning" he's recently gone over some new research from Wehner et al (see note in references). What Wehner et al do is as follows: They use an ensemble of 19 models used in IPCC AR4 and find a 'moist bias' (Western US) that causes the models to significantly under-represent observations of drought in the US and Mexico. they correct for this bias by normalising the model hindcast runs to observations for the period 1950 to 1999. Then they carry out this normalisation as the model runs continue into the future. The scenario forecast model runs Wehner et al consider use the A1B forcings, scenario hindcast uses 20C3M which is simply based on observations for the last century. In A1B atmospheric CO2 concentration rises to over 600ppm by 2100, so objections that we do not have enough fossil fuels to meet A1B do not seem reasonable, especially given the likely amplifying effects of the carbon cycle. What Wehner et al find is that by 2040 40% of the US and Mexico is in drought, rising to 60% by 2100, with 30% of the US and Mexico in extreme drought by 2100. They note that their application of past bias might not apply in the future, it is to be hoped that is the case. If they are correct and similar conditions apply on a similar scale across Eurasia the implications are serious. It is possible that I am wrong and that we are on the verge of a massive and catastrophic release of methane, however I wouldn't have tied my colours to the mast with these posts if I thought there was a good chance of my being wrong. As always reality is the final arbiter, and as reality doesn't give a stuff for opinion, the aim should always be to match opinion to reality using evidence. As with claims of an imminent and rapid transition to a seasonally sea-ice free Arctic; the problem such easily testable claims based on limited evidence is that when they don't come to pass the public perception of AGW threats as being overstated tars even the strongly evidenced threats. If come 2020 the Arctic has transitioned to a seasonally sea-ice free state, and the ESAS is bubbling with many gigatons of methane, I will be able to say I was wrong and that things were much worse than I thought. If these things fails to come to pass, what will those proclaiming the imminence of these events say? How will they undo the damage they've caused to public perception? Archer & Brovkin, 2006, "The millennial atmospheric lifetime of anthropogenic CO2." Bentley, 2002, "Global oil & gas depletion:an overview." Fisher et al, 2011, "Arctic methane sources: Isotopic evidence for atmospheric inputs"
Hubbert, 1976, "Exponential Growth as a Transient Phenomenon in Human History." McGuire et al, 2009, "Sensitivity of the carbon cycle in the Arctic to climate change." Google the title and you should find it's the top hit. Schmidt & Shindell, 2003, "Atmospheric composition, radiative forcing, and climate change as a consequence of a massive methane release from gas hydrates." Wehner et al, 2011, "Projections of Future Drought in the Continental United States and Mexico." I've been unable to locate a paywall-free copy of this, however there are some lecture slides from Wehner, available here. I've found that very useful in lieu of the actual paper.